With so many browsers out there, the browser wars keep heating up. 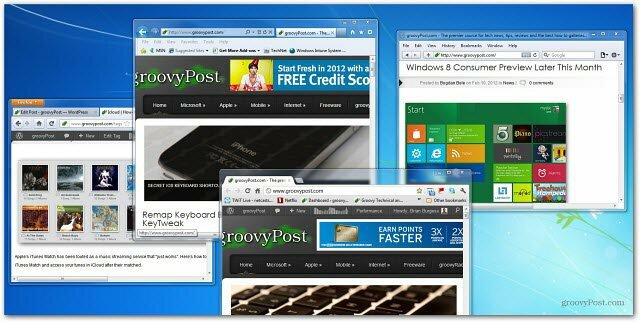 Here at groovyPost we’re interested in knowing which one is your default browser. Maybe you are forced to use Internet Explorer at work, but prefer Google Chrome or Firefox at home? Cast your vote in the poll below and leave us a comment on why you prefer the browser you choose. Have fun! Chrome All the way. Used to use opera then seamonkey. finally settled on chrome. I am sticking with Firefox. Old habits die hard. I am just so familiar with it and am comfortable with it. Although, I use Chrome when I need a second browser open. Trying to get it to where my custom setup of Firefox is…that I’ve been working on over the years. Firefox for the win. I was using Google Chrome for awhile but got hooked back into Chrome due to all the awesome Firefox plugins. WaterFox, the only 64bit variant of Firefox that is actually fast like hell………………. Maybe there is a Master Password for it now? Or does anyone know of a plugin for it? Have you tried “Lastpass”… works for almost all the browsers including chrome and firefox. Went off Firefox sometime ago when they introduced multiple updates, although the kids still love using it because each can have their own Profile. Chrome also has this feature, which I use from time to time. As for my main browser I use Internet Explorer 9. Has never caused issues or broken down, unlike some iterations of Firefox. Tried Opera and Safari, but they’re not as good as IE9. I found those two browsers to be quite cumbersome and not so user friendly. I like Internet Explorer.I tried Firefox for about a year but came back to I.E.It’s so much simpler when dealing with downloads.I actually lost 6 downloaded songs because I couldn’t find the file Firefox put them in. Yeah, actually IE 9 is pretty solid for sure. I use it to go to certain Microsoft sites like Technet and others just cuz they dispaly SO much better. A big fan of Firefox – I am a bit of an addon freak, though. Sticking with FireFox (but boy it pisses me off on a regular basis). Really only because of its integration with FireFTP (which I use seamlessly and constantly as I manage multiple websites).Please nobody tell me patronizingly that I can open a separate window with whatever FTP client and use Chrome. NO… that doesn’t cut in in a 5 or 6 hour day at the keyboard!! I do, however, keep Chrome open in my secondary workstation laptop on my iGoogle page. The gmail widget only refreshes properly on it, in FF it requires regular refreshing, and I need to monitor my mail AND RSS feeds constantly. As for IE…I bill my clients double if I have to open that godforsaken M$ P.O.S. I agree with you on that one. It’s the Extensions (Or Add-On’s) that keep me locked into Firefox as well. That and the ability to resize images on WordPress through just click and Drag. IE and Chrome can’t do that. And yeah… I also use Chrome half the day but usually find myself back in Firefox normally. I use Firefox, most of the time. I also like chrome for some special features, but the only thing I’ve been unable to get over, is the chrome tab bar. It must be below the address bar. The day chrome gives me the option to move the tab bar below the address bar (just as in Firefox), I’ll start using chrome and maybe stop using FF because it is often too resource heavy. I really like Chrome and used it until about six months ago when it became tragically slow–map renderings literally took minutes. Interestingly, nobody seemed to know why. Now I use Opera, I like it and it’s fast, but would have preferred the “old” Chrome. I prefer Opera. SeaMonkey would be my second choice. @Terry – you know, I’ve never ventured away from the big 3 (Firefox/Chrome/IE). I should really give Opera a shot. Do you like it because it has nice Add-on’s or its speed or? Firefox is my favorite but for android phone it’s hard to beat opera’s speed. In Windows XP for me it was Love Firefox but use Chrome…. With Windows 7 however, Firefox 10 is Magic. Still use Chrome at times and I.E 9 on the rare occasion. A while back I would of said IE 9. But after playing around with Chrome for a while … I got hooked! Why is not Maxthon in the poll??? i also like maxthon . i hope maxhon3 will be as good as maxthon2. I found IE9 is the best of all. It’s awesome.